Hey Guy’s, Welcome to the VERY interesting blog of our Guest Blogger for this Month- JenniTRX. Here at Veronica’s Snacks we love Jenni’s blog and facebook page and we were only delighted when she said YES to writing a few pieces for our “ Don’t be a couch Potato, Be a fit Potato” campaign. Jenni is a qualified TRX instructor with the Official TRX Training Studios in Fairview Dublin and creator of the successful Clean eating and Fitness blog Jenni TRX.ie. Jenni created the her blog and facebook page in order to show people, from her personal perspective, that eating healthy and keeping fit is achievable and possible for everyone. Jenni works hard taking all of the info that is available on the internet and research and placing it into the Irish market, looking for ingredient alternatives and substitutes that we can actually get in our local Irish stores. Jenni is just a normal Girl with a stressful job during the day in one of the biggest advertising agencies in Dublin, She attends college in the evenings & weekends to qualify as a Personal Trainer whilst also Teaching TRX classes with the TRX Studios in Fairview Dublin… She still manages to fit in Eating Clean, and Staying Fit. So there really is no reason we all can’t try to make a few small changes to try and do the same. Just like most people I had an unhealthy relationship with food. When I was younger I often listened to other people and believed that in order to loose weight I need to eat less food and follow whatever fad diet was the latest craze. I’m pretty sure I’ve tried them all in the past, to me they all had one thing in common, they all restricted your intake in at least one particular food group or macro nutrient… no carbs, no sugar, no fat….. It was only really when I hit my late twenties and I really got into fitness that I began to investigate how your body works and especially how it breaks down and uses the various macro nutrients in our food (proteins, fats and carbs). There is just so much conflicting information and opinions out there that I began to feel like I was drowning in it, that was until I started going to the TRX Studios, where I am now a trainer, 3 years ago and began working with my mentor Steve Doody. He thought me the importance of eating a well balance diet and how skipping out on carbs and sticking to other fad diets were dramatically effecting not only my over all health but also my ability to get an efficient and effective output from my workouts. Whilst studying for my Qualification in Fitness and Health I am studying Sports Nutrition and what we need to eat in order to maintain a healthy body. This in depth look at how good healthy natural REAL food works on a cellular level versus the damage and stress that processed junk causes combined with the physical positive outcomes I was beginning to see in my own body and workouts from eating healthy drew me to one conclusion: that a Clean Eating lifestyle was only way forward for me. 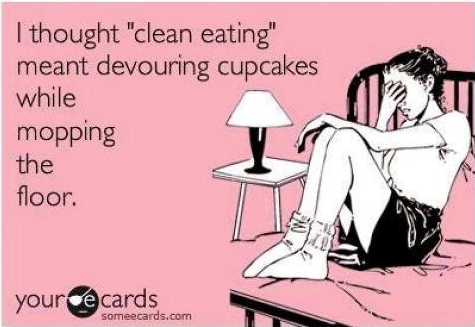 So what is Clean Eating exactly? Clean Eating is the ultimate “un-fad” diet. It is about eating more of the best and healthiest versions of each of the major food groups (carbs, proteins and fats) —and eating less of the not-so-healthy ones. That means embracing foods like vegetables, fruits and whole grains. It also means cutting back on and trying to limit your intake of refined grains, added sugars, table salt and unhealthy saturated fats (artificial flavorings, artificial colorings, and sugar substitutes). Clean eating is not a new revelation it’s the way our Grandparents used to live, there were very little processed foods back in their time, modern ways of living and technological advancements has introduced us to words like, Hydrogenated fats, E numbers and chemical sweeteners. Clean Eating has reemerged out of a necessity to try and combat the increasing numbers of deaths every year in Ireland related to bad health from a poor diet. Heart disease, cancer, stroke and diabetes are in almost every household in the country including my own. They are for the majority lifestyle related conditions. We’re all affected by it. There is a common misconception that eating Clean or healthy is more expensive than fast food / processed food choices. With the introduction of Value supermarkets like Aldi & Lidl I don’t find this to be the case at all. There is a personal labour cost involved I will admit that, in that you have to put in some prep work and time to make your owns foods but I think this should be considered an opportunity cost, the opportunity being you have a Healthy body. People seem to put more time into selecting their car, clothes and holidays than the food they put into their bodies. To help you try and understand what Clean Eating is exactly I’ve summarized the 10 main principles most people who eat clean try and stick to. They are a guide rather than a rule and you can be as strict or as lenient as you wish. But…..you’ll have to tune in tomorrow for those :)! I promise you they are worth it :)! Great read, look forward to your next post!